The cellular layout has been compared to the traditional functional layout using multiple comparison methodologies that either lack objectivity or are highly time-consuming. 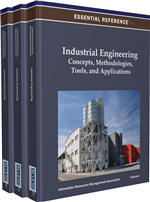 The main purpose of this chapter is to propose a novel and objective methodology. Hence, a critical analysis of ten comparison studies is followed by the presentation of the layouts simulation models. Subsequently, the proposed comparison methodology is described. Following this methodology, simulations are conducted according to a plan of experiments developed from Taguchi standard orthogonal arrays. Consequently, results, expressed in Signal to Noise ratios, are analyzed using ANOVA. Next, a mathematical model is derived by interpolation between the factors and interactions effects. This model must be validated by the confirmation test, otherwise the comparison methodology should be reiterated while considering new interactions. This cycle should be reiterated as much as necessary to obtain a valid mathematical model. The proposed comparison methodology has been applied with success on an academic manufacturing system. The increased competition within industry has resulted in manufacturing companies spending considerable effort to improve flexibility and responsiveness to meet customer needs. Cellular manufacturing, a facet of group technology, has emerged as one of the major techniques being used for the improvement of manufacturing competitiveness. A large number of empirical, analytical and simulation studies have been devoted to compare the cellular layout (CL) to the classical functional layout (FL). Simulation-based comparative studies constitute the mainstream of this research field. Varied results were reported by these comparative simulation studies. Indeed, different researches found the FL always superior to the CL with regard to all used performance measures (Jensen, Malhotra, & Philipoom, 1996; Morris & Tersine, 1990, 1994). Further researches reported that the CL is superior to the FL in all operating conditions (Pitchuka, Adil, & Ananthakumar, 2006; Shafer & Charnes, 1992). Finally, other simulation studies showed that every layout could outperform the other in different particular experimental conditions (Faizul huq, Douglas, & Zubair, 2001; Farrington & Nazametz, 1998; Li, 2003; Shafer & Charnes, 1995; Suresh & Meredith, 1994). The divergence in the studies conclusions is referred to as the “cellular manufacturing paradox” (Shambu, Suresh, & Pegels, 1996). In fact, Agarwal and Sarkis (1998) and Shambu et al. (1996) reviewed a number of FL-CL comparative studies. However they did not identify any objectivity flaws responsible for the conflicting conclusions. Indeed, they simply reported the major findings of some published studies without any critical objectivity assessment. Actually, methodologies used by comparison studies vary widely but can be classified into three groups. In the first group, authors used the one-factor-at-a-time method. So the two layouts are first compared for one manufacturing context considered as the “base model”. Then, other experiments are carried out in order to test the robustness of the layout choice obtained in the base model. Every experiment corresponds to the modification of a single operating factor (Morris & Tersine, 1990, 1994). In the second group authors considered only some specific combinations of the studied factors settings without any justification (Faizul huq et al., 2001; Li, 2003; Suresh & Meredith, 1994). In the third group authors used the full factorial design technique in order to study the effect of all factors (Farrington & Nazemetz, 1998; Jensen et al., 1996; Pitchuka et al., 2006; Shafer & Charnes 1992, 1995). Methodologies belonging to the two first groups undoubtedly lack objectivity in the choice of the experimentation conditions. Therefore, they do not permit to attach any statistical confidence level to their conclusions. In addition, they do not provide any information about factor interaction. The third group methodology is highly time-consuming. In addition, it is impractical when the number of factors to study is large. This chapter essentially focuses on the development of an objective FL-CL comparison. It first highlights the lacks of objectivity of the main published FL-CL simulation-based comparison studies in order to explain the origin of their conflicting conclusions. Then it deals with the development of comprehensive FL and CL simulation models using the widely used commercial simulation software Arena 7.0. Finally, it presents the framework of a methodology, based on the coupling of the Taguchi method of experiment design (TM) and simulation. This methodology can be easily applied to any manufacturing context and provides trustworthy results with a minimum experimentation effort.